The Chocolate War by Robert Cormier (1974). This is not a feel-good book. I'm glad I read it, but I don't want to pass it on to anyone else because it left me frustrated and empty like some really good books tend to do. The story is set in an all-boys Catholic high school lead by Father Leon, a bullying priest who threatens and humiliates students publicly to teach "lessons." One student refuses to sell chocolate. He is the individual who wants to test limits and also be respected for expressing his opinion. At first this causes no problem but as more students come to support and admire the dissenting student, Father Leon sets off an escalating culture of oppression and violence by the student's peers. 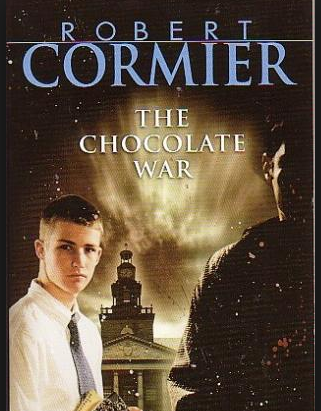 Ultimately the individual who stood up for his right to not sell chocolate is attacked several times and in the last pages of the books is being taken to a hospital. In response the other boys shrug and look for chocolate to eat, ready to find another way to direct their testosterone. This book was about as enjoyable as Lord of the Flies. If you've read the book, you understand. Some parts are hard to read, hard to imagine. You want to put the book down, cross the words out, skip to the next scene and pass over the ugliness but you cant. The Chocolate War, Book #66 assigned to me by my college students, is important to read, important to talk about, but not the happiest way to spend the last Sunday afternoon in August.